For company brochures, informative guides and handy downloads you've come to the right place! We regularly upload helpful resources and downloads to this section of our website for anyone to use. However, if there is anything you can't find or would like further information on, please contact us at sales@ntsols.com or 01252 235 235. 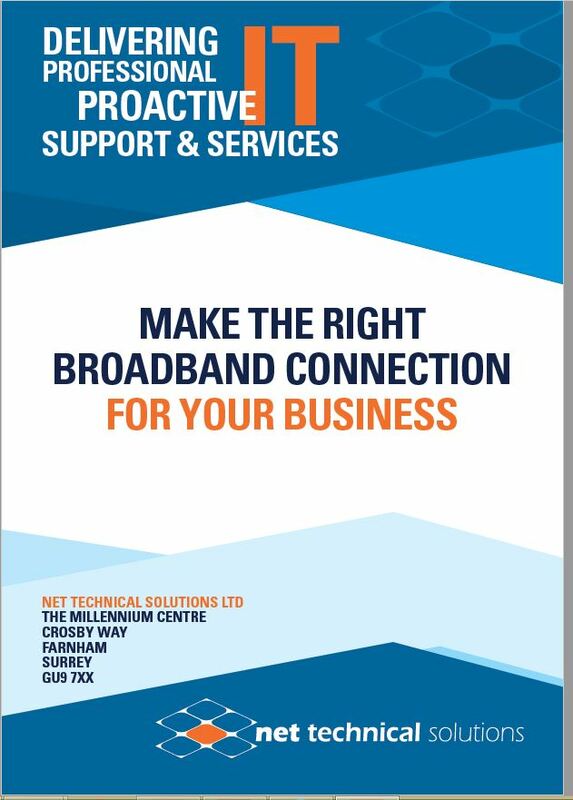 If you would like to find out more about Net Technical Solutions and the services we offer, please download our company brochure below. 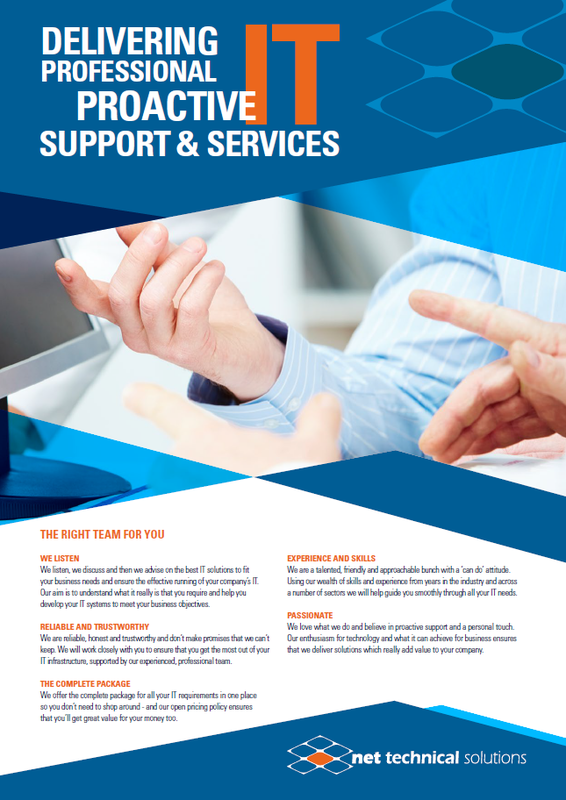 Just like this website, our brochure aims to give you a clear overview of our core business areas - IT Support, IT Services and Software Development, as well as information on how we can work with you to provide your company with everything it needs to run and maintain an efficient and effective IT System. Next year, in 2020, a number of Microsoft business software packages reach End of Life and if your business is running any of them, then you could have a problem. 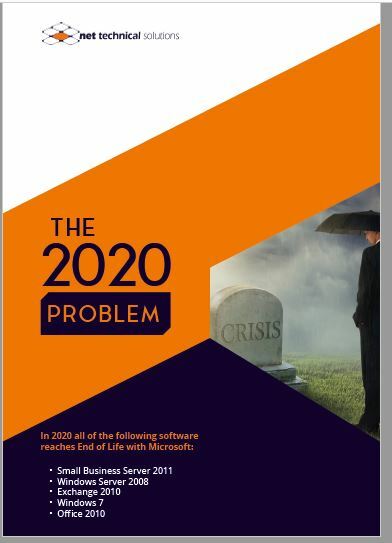 Find out from our new guide what 'End of Life' actually means, which software packages are affected and why you shouldn't wait until 2020 to do something about it. You’ve probably heard of phishing attacks but do you know what phishing actually means? 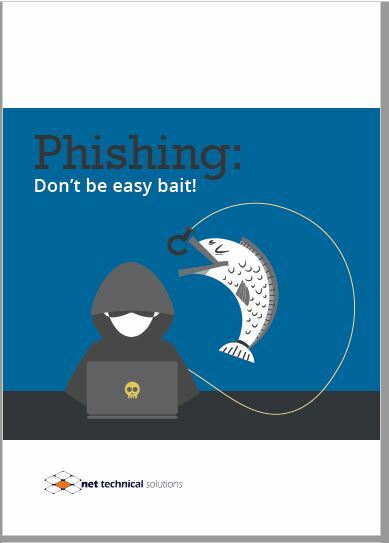 We’ve written a brand new guide which explains what phishing is, how it works and more importantly what you can do to protect your business from attacks. On 25 May 2018 the new General Data Protection Regulation (GDPR) came into effect and impacts each and every organisation that holds or processes personal data. Net Technical Solutions is, and has always been, committed to high standards of information security, privacy and transparency. We have recently been awarded Cyber Essentials accreditation through the IASME which ensures that we comply with applicable GDPR regulations now that they have come into force. 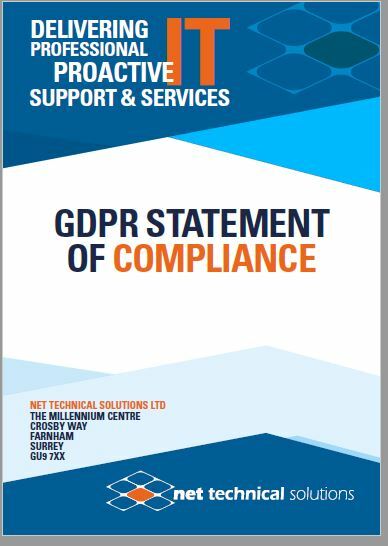 We are also fully aware of our role in helping to provide the right tools, systems and processes to support our customers’ need to meet their own GDPR mandate. Read our Statement of Compliance here, along with some thoughts as to what you can do to be GDPR compliant. We pride ourselves on providing the very best Internet connectivity to keep your business operational - be it simple access to email, the ability to run video conferencing, or having your business telephony run over the internet (also known as ‘Voice over IP’ or VoIP). Read our useful guide which explores the different Internet connectivity options available and explains the benefits of a 'business-grade' broadband service, information on the various services available and the differences between ADSL, FTTC, FTTP and Ethernet. 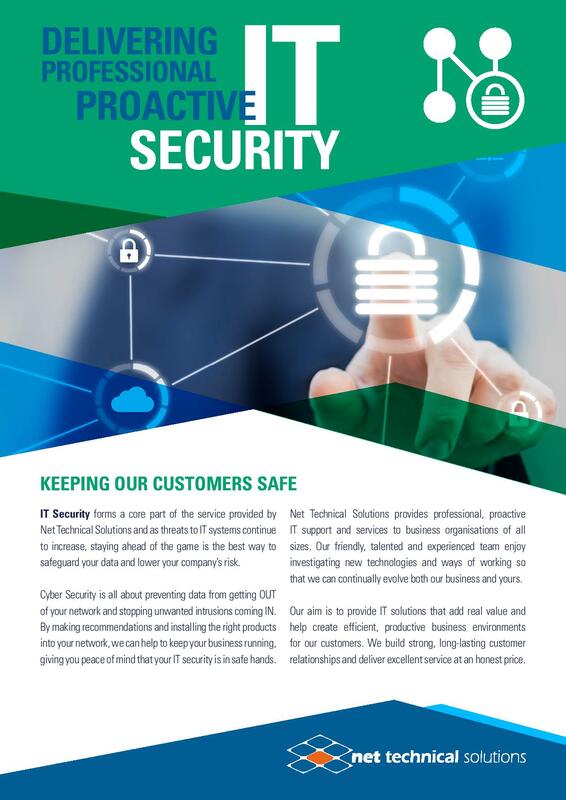 IT Security forms a core part of our service provision and this datasheet will give you a better understanding of what Net Technical Solutions can offer you. 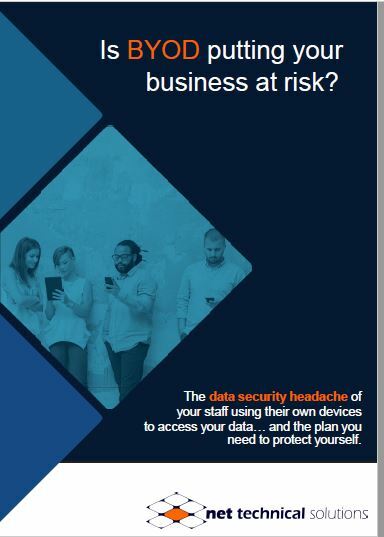 Our leaflet outlines how we can work proactively with you to lower your company’s risk and help safeguard your data and details our layered solution to your Cyber Security needs which will build up your IT defence and can be tailored to meet your organisation's specific requirements and budget. Buying the right type of IT Support for your company can be costly and time-consuming, but it doesn't need to be. 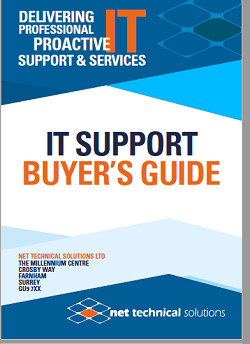 Our IT Support Buyer's Guide covers everything you need to know and what you need to consider to make the best decision for your company. This comprehensive guide includes the different types of IT Support available; the pros and cons of outsourcing; explains the different outsourcing models and gives you points to consider when reviewing your IT Support. 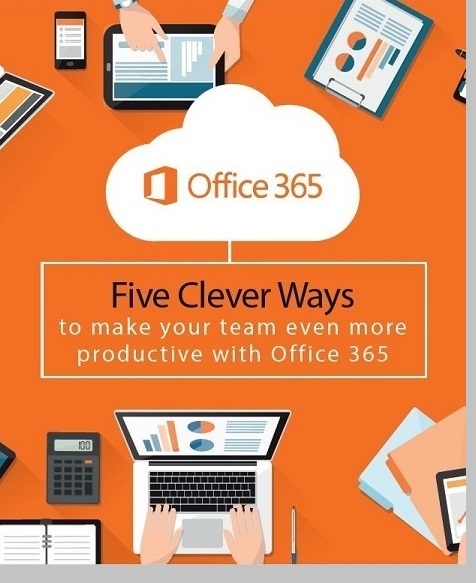 Microsoft Office 365 has all sorts of brilliant features which could really help boost your team's productivity levels. In our latest guide, we've put together five of our favourite time-saving features and show you how to make this Cloud-based software work even harder for your business. This document outlines our step by step guide to performing your own IT health check. 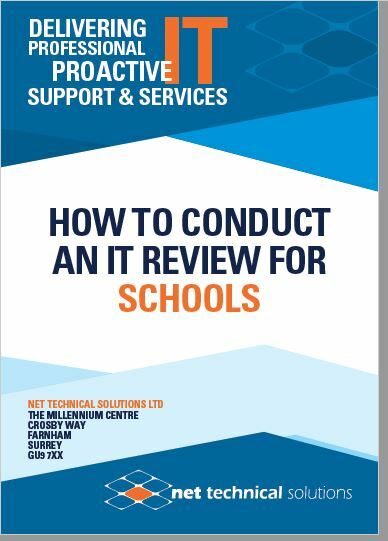 It will help you conduct a complete review of your current situation and is ideal for anyone working within the Education sector and looking to review or update their current technology. Now more than ever, educational establishments such as schools, colleges and universities depend on robust, reliable IT systems to keep their daily activities running as smoothly as possible and maximise their pupil's learning. However, failing equipment, outdated software and slow or difficult-to-use IT systems can have a huge impact on the overall effectiveness of a school’s operation. Add to this stretched budgets, the pace of change, rising costs and ever increasing cyber security threats and it makes sense to adopt a thorough IT review on a regular basis. You’ve probably heard of the concept of ‘dog years’. For every human year, a dog ages 5 to 9 years which means that dogs age faster than we do. Well it’s exactly the same with computers and your IT setup. 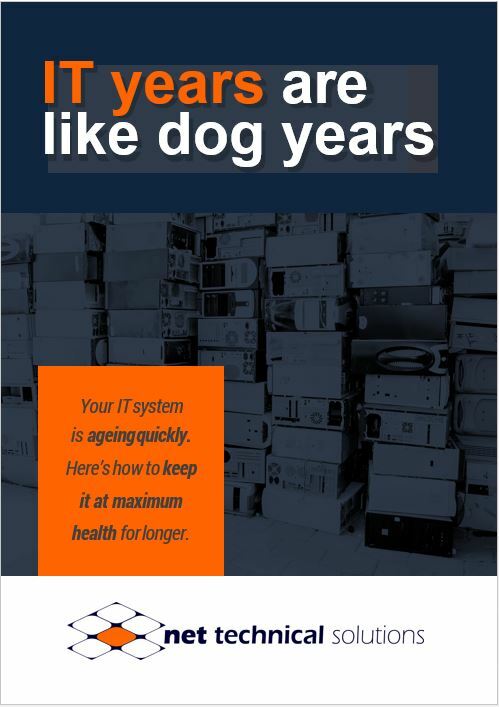 An ageing IT system can mean a drain on your company's time and resources. Our guide helps you to understand the effect it might have and the signs to look out for that show when your IT setup is getting too old and inefficient and what you can do to prevent it from affecting your business. You may well have heard the term BYOD which stands for Bring Your Own Device. Many people use their own personal mobile, iPad, tablet or laptop to do company work whether it’s travelling to and from the office, whilst at work or at home. This means that they have access to company data on devices that your company has very little or no control over. Read our guide to BYOD (Bring Your Own Device) which highlights the 6 areas that you should be concerned about and gives advice on what to do about them.